Front yard, all flowers, herbs sleeping. In October of 2011 the National Science Foundation online magazine published an article by Miles O’Brien and Jon Baime ‘ regarding cerebral hacking or (BCI) experimenters discerning thoughts of human subjects by vibrations of neurons in the brain. In a Science Direct, article from Egyptian Informatics Journal, July 2015 by Abdulkader, Atia and Mostafa at Cairo University… in section 3.6. Security and Authentication, researchers have found that in BCI, biosignals can be used as a source of identity. (Computer chips used in humans and animals for GPS positioning is becoming a thing of the past.) In section 5. Signal acquisition in MIT article, it is reported that ‘...there are two general classes of brain acquisition methods: invasive and non-invasive methods. 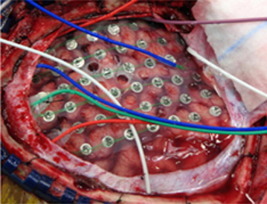 ‘…in non-invasive technologies brain activity is measured using external sensors. The above electrodes are/have been used in brains of voluntary disabled people, and unsuspecting involuntary subjects coerced by U.S. military, to revolutioniz BCI since 1950’s. Today directed energy- sound, microwave and electromagnetic waves are being used daily in the United States in the grandest covert ‘security’ experimentation of all time. Using millions of unsuspecting persons of interest and ‘undesirables’ BCI is being perfected using directed energy weapons, gangstalkers and military NSA, CIA and FBI researchers to fine tune existing technology. BCI has already been produced and is being used in illegal experimentation all over the country. When brain interfaced ‘watched’ eye balls roll around in head and could hear experimenters asking questions. Believed to be dying after undergoing directed energy weapon torture for hours, I began to pray in mind. Repetitive prayer, over and over and over repeating God’s name and thanking God for ‘everything exactly the way it is today.’ And I felt at peace being with God. Interrogation through cerebral hacking allowed my thoughts to be heard as audible speech in computer, as were my thought-prayers. Upon hearing my prayers, the experimenters stopped all torture and inquisition abruptly. Multiple types of BCI machines are up and running today. News reports will stay 30 years behind the times to keep U.S. citizens ignorant as they are subjugated.